Clint Holmes is a stellar singer with a very impressive resume. Holmes, who will headline a show at Rrazz Room (6426 Lower York Road, New Hope, 888-596-1027, www.TheRrazzRoom.com) on May 5, is more than just a great singer. He is a performer, recording artist and vocalist — one of those rare performers who can legitimately be called one of the greatest contemporary entertainers of our time. While the concert stage remains the mainstay of Holmes’ career, he moves effortlessly between the worlds of music, television and theater. Voted Best Male Singer by the Las Vegas Review-Journal, and Best Singer by Broadway.Com, Holmes has been a Las Vegas show attraction since the early 1970s. In 2006, he closed his headlining show at Harrah’s Las Vegas Casino, which renamed its main showroom for him. Over the course of 20 years performing, Holmes has served as Joan Rivers’ sidekick and announcer on “The Late Show”, as the musical feature and event correspondent for “Entertainment Tonight”, and as the host of his own Emmy award-winning talk/variety show. Ironically, many people are familiar with Holmes only through his 1972 massive hit, “Playground in My Mind” — a song that stayed for 23 weeks on the Billboard Hot 100 chart. Even more ironically, Holmes doesn’t consider the song as a “must play” selection when he performs on stage. “I’m not really singing ‘Playground in My Mind’ in my Vegas show,” said Holmes, during a phone interview Monday evening from his home in Las Vegas. “I do allude to it. The son of an African-American jazz musician and a classically-trained British opera singer, Clint Holmes was raised with the best of two musical worlds. Blessed with a powerful tenor voice, magnetic stage presence, and a charming comedic streak, Holmes is a natural as an entertainer. Having relocated to Washington, D.C., Holmes continued to sing in clubs after his discharge and gained a regional following. While performing at a club in the Bahamas, he was spotted by Johnny Mathis’ producer, who was interested in having Holmes cut a couple songs, including “Playground in My Mind.” Recorded in May of 1972, the song was an unmitigated flop upon its release the next month. However, in November of that year, a radio station in Wichita, Kansas, began playing the song in conjunction with the holidays (apparently feeling that the sing-song nature of the track gave it a seasonal feel). It drew a massive response and led to more stations picking up on it. Before the year was out, Epic Records, which has originally released the single, had Holmes in the studio to record a full-length album in hopes of capitalizing on the song’s increasing momentum. But Holmes never carried on in pursuit of a career as a hitmaker of pop songs. Instead, he honed his career as a performer whose appeals spans genres and generations. Since moving to Las Vegas, Holmes quickly become a favorite in the Las Vegas community as well as a major star in the entertainment arena. 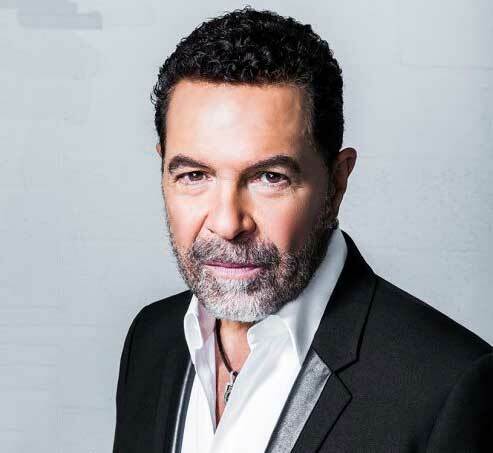 He was selected as “Best Kept Secret” by Las Vegas Life Magazine, and “Best Singer” (two years in a row), “Best All-Around Las Vegas Performer” and “Favorite Male Las Vegan” by the Las Vegas Review-Journal. Additionally, he has been the featured performer and host for the “Best of Las Vegas” gala for the Las Vegas Review-Journal and host of the “Las Vegas Life Epicurean Awards”. Holmes was inducted into the Buffalo Musical Hall of Fame and into the Casino Legends Hall of Fame. He also has become involved with several worthwhile causes in the community such as Candlelighters, ROB Reachout, Shadetree, St. Jude’s, and various cultural events. Following a brief battle with colon cancer, he is currently serving as a spokesman for the American Cancer Society, encouraging people over age 50 to have annual colonoscopies. The production combines the talents of two of Las Vegas’ top entertainers — Holmes and Earl Turner. Based on the music of their lives, the show combines their unique energy, voices, humor and life experiences to bring new life to the music that makes up the soundtracks of our lives. Featuring a live eight-piece band and the musical direction of Christian Tamburr, a three-time Down Beat Magazine Music Award winner, this musical performance is being presented at the historic International Westgate Theater. “One of the fun things about coming to clubs like the RRazz Room is that I can step out of what I’m doing,” said Holmes. “In Vegas, ‘Soundtrack’ is a set show – a set 90-minute show is way it is. It’s a fun show on the same stage that Elvis used to perform on. “It’s a lot different when I’m on the road. When I’m doing club shows, I can do whatever I want because nothing is set. I have a trio with me and we can step out between the songs. Video link for Clint Holmes – https://youtu.be/n2anpvvKyg0. Video link for “Playground in My Mind” (1972) — https://youtu.be/n08ETcI1AAo. The show at the Rrazz Room will start at 8 p.m. Tickets are $45 and $55. Theatre Exile is closing its 2017/2018 Studio X-hibition New Play Development series with its continued focus on women and transgender playwrights. Its final offering is the reading of a piece by MJ Kaufman — a heartwarming family-friendly story of the bond between siblings. 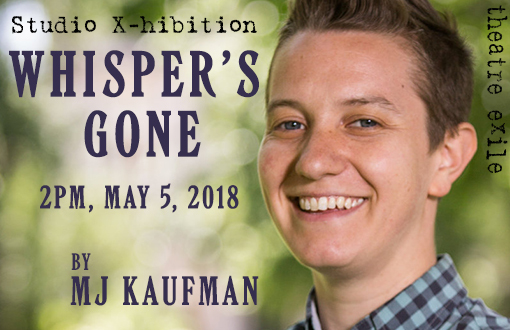 Kaufman’s work – “Whisper’s Gone” — will be presented on May 5 at 2 p.m. at the Latvian Society (531 North Seventh Street, Philadelphia, http://www.theatreexile.org). Theatre Exile is a nonprofit theater company dedicated to enhancing the cultural experiences of Philadelphians through the staging of works that engage the imagination. It produces challenging plays that explore the complexities of the human condition and contain a sense of Philadelphia grit and passion. The company strives to reach new theater audiences throughout the community by presenting both new works as well as established plays that are often reinterpreted in original ways. According to Producing Artistic Director Deborah Block, “I love the work that Theatre Exile does on our mainstage. I think it is poignant and timely and sometimes it is rough and only suitable for mature audiences. However, Theatre Exile is doubling down on its commitment to reach out to diverse audiences. MJ Kaufman is a playwright and devised theater artist working in New York and Philadelphia whose work has been seen at the Huntington Theatre, New York Theater Workshop, the New Museum, Clubbed Thumb, New Georges, Page73, Colt Coeur, Yale School of Drama, Lark Play Development Center, and Bay Area Playwrights Festival. Kaufman, who has performed in Russian in Moscow, received the 2013 ASCAP Cole Porter Prize in Playwriting, the 2013 Global Age Project Prize, and the 2010 Jane Chambers Prize in Feminist Theatre. Originally from Portland, Oregon, Kaufman attended Wesleyan University and received an MFA in playwriting from the Yale School of Drama. Additionally, Kaufman has co-curated the 2016 and 2017 Trans Theater Festivals at The Brick. “I write plays and stories about trans and gender/queer characters,” said Kaufman, during a phone interview Monday from Los Angeles, where she is working as a script writer for a television show about Sabrina the Witch. In “Whisper’s Gone,” nine-year-old Bailey is having a really fun summer until her older sibling Whisper disappears. Camp counselors and parents are thrown into confusion. But, Bailey knows where Whisper went. It all has to do with a top-secret time travel mission. The big question is — does she know enough about time-travel to accomplish the mission? The funny and heartwarming story of “Whisper’s Gone” touches on family dynamics, divorce, growing up transgender, sibling loyalty, and, of course, time-travel. It is family-friendly and recommended for children (ages 7 and up). Video link for Theatre Exile — https://youtu.be/7hBR6GQIfwY. The reading is set for 2 p.m. on May 5. Tickets are $10. Music fans of women who rock – and rock hard – have two reasons to travel westward this weekend. On May 6, Madame Mayhem will play a show in Lancaster. On May 7, Butcher Babies will perform in Reading. With a name like Madame Mayhem, no-one would expect Saturday night’s opener at the Chameleon Club (223 North Water Street, Lancaster, 717-299-9684, http://www.chameleonclub.net) to sound like Adele or Joni Mitchell. Manhattan-born singer-songwriter, Madame Mayhem is a true rocker with an eclectic style in every aspect of life. With her ‘in your face’ attitude, mayhem is definitely the right word to describe this extreme artist. 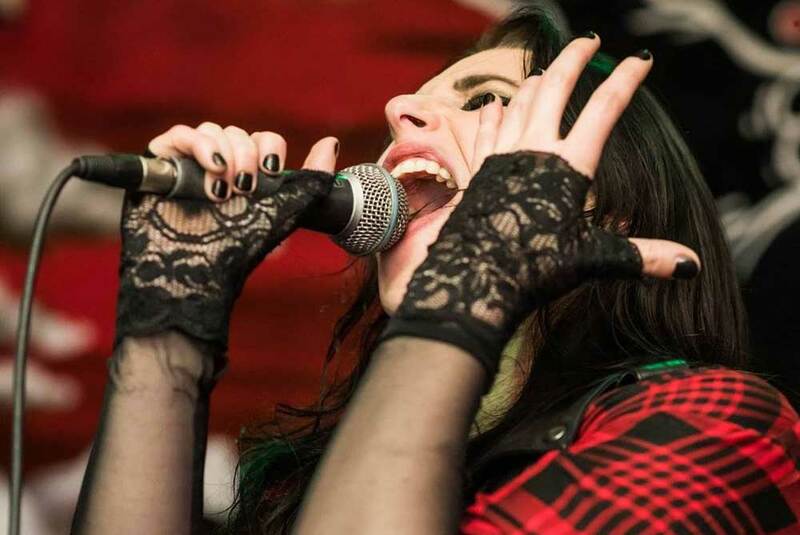 She began to take the music scene by storm when she was featured on Clear Channel’s iHeartRadio New Discovered and Uncovered Artist chart, before opening for Buckcherry’s Live Nation tour at The Sands Casino. She has already begun to create buzz in North America and internationally. Madame Mayhem has performed across the nation to packed rooms, including The Roxy, The Viper Room, Bowery Ballroom, and the Knitting Factory. She has had a residency at The Cutting Room and performed on Shiprocked Cruise 2017. “We’re a hard rock band,” said Madame Mayhem. “Not all the guys in my touring band were musicians on the album, which came out at the end of October. “I recorded the album in Atlanta and Corey Lowery produced it. We had written a few songs together on my previous album and got along great. Madame Mayhem has collaborated with notable rock talents including Billy Sheehan (Mr. Big, Winery Dogs), Ray Luzier (KoRn, KXM), Ron “Bumblefoot” Thal (ex: Guns N’ Roses), Russ Parrish (“Satchel” from Steel Panther), Grammy winner Mark Hudson, Earl Slick (David Bowie, John Lennon), Rudy Sarzo (Ozzy Osbourne, Quiet Riot, Whitesnake, Dio), John Moyer (Disturbed), Corey Lowery (Saint Asonia), and Clint Lowery (Sevendust). “We were recording it in between my touring schedule,” said Madame Mayhem. “We like to knock out a lot quickly. The coolest part was doing different ways of recording. It’s always fun to play live in the studio and keep it as organic as possible. “I’ve been doing this my entire life. When I was young, I had acting, piano and dance classes. I did musical theater and studied opera. “But, I was always listening to rock. Hard rock was always my favorite. I was a grunge baby listening to Soundgarden and Alice in Chains. I was listening to Korn at the same time as Brittney Spears. Video link for Madame Mayhem – https://youtu.be/6p9Ba1YCe54. The all-ages show at the Chameleon Club, which also features Sevendust and Memphis May Fire, will start at 5:30 p.m. Tickets are $28. Butcher Babies definitely “double the pleasure and double the fun” when it comes to having a band fronted by a badass female vocalist. The loud and talented quintet is fronted by singers Heidi Shepherd and Carla Harvey and also features guitarist Henry Flury, bassist Jason Klein and drummer Chase Brickenden. Butcher Babies released their third full studio album, “Lilith,” on October 27, 2017. It was produced by Steve Evetts (Suicide Silence, Dillinger Escape Plan, The Cure) The album peaked at #1 on the iTunes Metal chart and received praise from a number of metal music magazines. With three albums and two EPs under their belt, Butcher Babies have reached a new level of maturity solidifying a triumphant return after a brief creative hiatus to write and rebuild. “‘Lilith’ came out six months ago and now we’re hitting the road and playing new songs,” said Harvey, during a phone interview Friday afternoon from a truck wash in South Carolina. “Today, we’re on our way to Country Rebellion. Harvey said, “We had about 24 songs that we had written together. We played them all live for Steve. Then we whittled it down to the 11 that were on the album. While it has only been seven years since the release of Butcher Babies’ eponymous debut EP, the band’s roots go back much longer. “Carla and I started writing together eight years ago in a punk rock cover band we were in L.A.,” said Shepherd. “We wanted to do something different. In 2009, we created the band in L.A. That was the start of Butcher Babies. 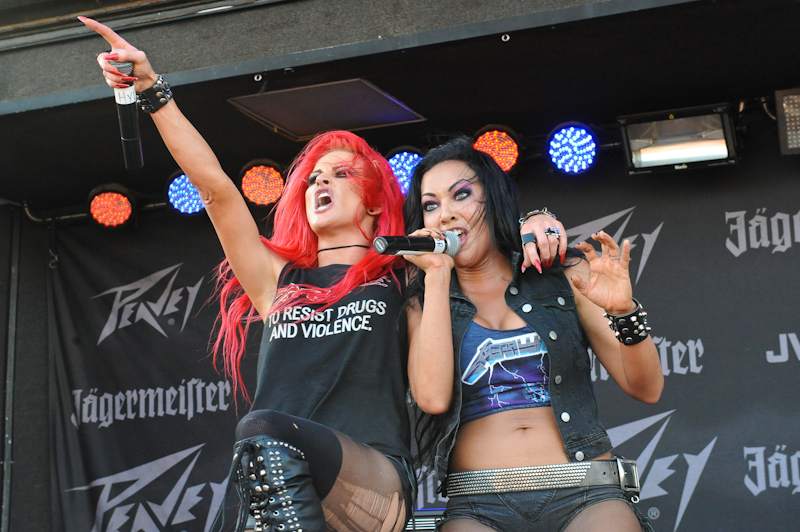 Butcher Babies has evolved to a high level even more quickly than the pair expected. “When we started this band, the original plan was to have a great time together,” said Harvey. “It’s really grown since then. We offer something unique with two females fronting the band. We both have different styles. I grew up listening to Pantera and Slayer while Heidi was more into bands like Slipknot. Much has changed since those early days. “A lot has happened over the last nine years,” said Shepherd. “At first, we were a bunch of friends who played shows on Sunset Strip. We spent two years courting record labels. Then, we got breaks like opening for Marilyn Manson and touring with Megadeth. Video link for Butcher Babies – https://youtu.be/cWzFlREfApk. The show at the Reverb, which also features Nonpoint, Cane Hill and Sumo Cyco, will start at 5:30 p.m. Tickets are $20.